I think I’m signed up for every email list serve that includes health tips, healthy cooking ideas, recipes, nutrition research…you name it. To be honest, I rarely open them and simply peruse the subject title, hoping something strikes me. But the other day it did. The subject line was, “Most Pinned Recipes”. Catchy. 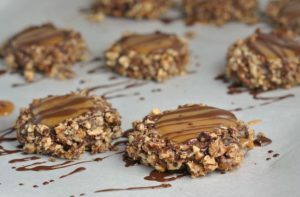 Pinterest is pretty hot right now, and I myself have certainly scored some great ideas…and recipes. I opened the email and this recipe title immediately caught my eye. Between the “overnight”, “peaches and cream”, and “French toast”…it was a slam dunk for me. Plus, I’ve been in a breakfast slump and being able to reheat portions of this for the week has been easy, breezy, and delish! I made this recipe on Saturday, baked it on Sunday. Fifteen minutes of hands on time and I have breakfast for days! Thank you, email list serve! I also loved the price breakdown on this recipe – $1.04 per serving! That’s less than my morning cup of Joe! Spray a 9-by-13-inch baking dish. Arrange bread in a tight, flat layer in dish. In a large bowl, whisk eggs with milk, sugar and vanilla until blended; pour over bread. Arrange peaches on top and sprinkle with brown sugar and cinnamon. Cover tightly and refrigerate for at least 8 hours or overnight. Remove baking dish from refrigerator 30 minutes before baking. Preheat oven to 350 F.
Result: This was great…don’t let the photos fool you! This was sweet without being overly sweet. The serving size is large and with sides, this could serve 8. This is filling and reheats well…your coworkers will be jealous of the smells! This recipe took about 10-15 minutes to throw together and it is breakfast for the week! Whole grain, protein, fruit…all in one! Enjoy! Money Matters: I get bakery baguettes for $1.99 each (I used half). Free-range eggs are $2.50/dozen ($1.67). Canned peaches were $1.20 each. Milk is ~$0.20/cup ($0.40) and sugar is ~$0.66/cup ($0.33). The remaining ingredients are estimated at $0.45. The total cost of the recipe comes to $6.25 and $1.04 per serving. Already Wednesday – I’m lovin’ it! 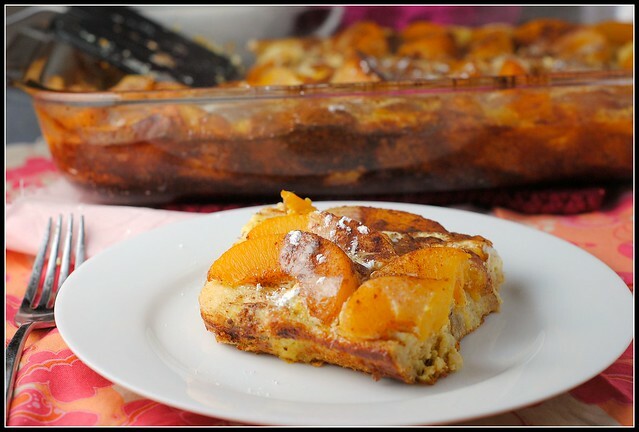 I really need to jump on this “french toast casserole” bandwagon! Seriously, this casserole and the last one (blueberry cream cheese, I believe?) are making me crave french toast like whoa! I can certainly understand why this dish is popular. 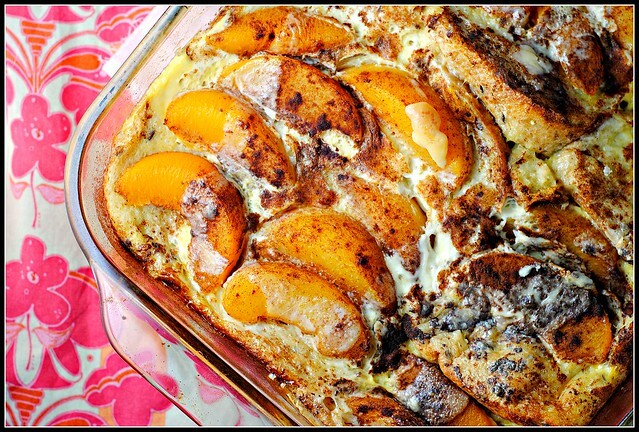 French toast casseroles are a very tasty way to go for breakfast. However, the flavors of peaches and cream do intrigue. This would be great for brunch-yum! Thanks for posting this, your photos are very enticing. I justhave to say you’re one of the only bloggers where I star almost every recipe you make! Now actually getting around to making them is another story, byt I have good intentions that they’ll all get made someday. 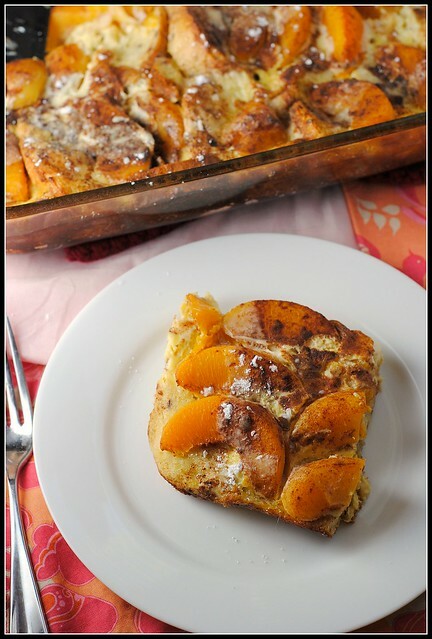 I have been meaning to make a french toast casserole and I think the Mr would flip over this! I would love to wake up to this in the a.m.! Ugh – I’m SO addicted to Pinterest! It’s crazy! I think it would work well with berries or cherries….mmm! French toast casserole is always a good idea. I made it for the holidays for my family and it was a big hit! What a fantastic way to prepare French toast, Nicole! This looks so delicious. Being a peach-lovin Texas girl I’ve got to try this, maybe even with fresh peaches! Mmmm. I am psyched for this one. Did you cut your bread into half inch cubes? or just into 1/2 inch thick slices? I wanted to pin this so that I can come back and make it later, but am unable to pin any photos from the post. I wasn’t sure if this was intentional (which is your right, I get it! ), but in case it’s not, I wanted to mention it. Dani, thank you for letting me know…I appreciate it. I am honored to have anything pinned. I will look into it for sure. Did you also try the “Pin It” button at the bottom of the post? Geez. I should have known better than to read your blog when I was already hungry. This looks amazing. I was JUST thinking about how much I would love a bowl of peaches and cream oatmeal right now, but this is a way better idea. I need to remember to buy some peaches this weekend. Holy yum Nicole. This looks amazing, and SO pin worthy!!! Hope you are having a great week. Wow, this looks incredible!! Perfect for a family breakfast or brunch! Overnight breakfast recipes make mornings so much easier! I’d bought all the ingredients to try this, but was in bed with the lights off by the time I remembered. (I just don’t think about prepping breakfast in the evening.) Still, I got out of bed at 12:30am, and whipped this thing together, even in a half-drowsy state. We’ll see tomorrow morning whether it was worth some midnight cooking. Thanks for this brilliant idea! I have done that before, too! I hope the juice is worth the squeeze ;). Let me know what you think!! Hi Claire! It’s not picturesque by any means, but the eggs are definitely still soft, yes. Cooked, but soft. 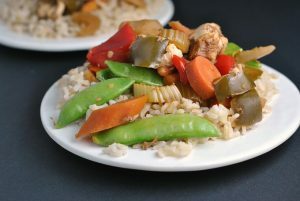 I ate on this all week last week – loved it! Microwave…but could easily be done in a toaster oven or traditional oven, too!